Since his debut last month, Nate Pearson hasn't had a whole lot of memorable moments in the Arizona Fall League. In Wednesday's outing, he crafted a few. Toronto's No. 4 prospect threw four perfect innings, striking out five on just 46 pitches anf Surprise Saguaros rallied with a four-run ninth to beat the Scottsdale Scorpions, 5-4, at Surprise Stadium. Pearson headed into his fifth AFL outing with a 11.12 ERA -- 15.75 in four appearances since the 3 1/3 scoreless innings in his debut -- but was fresh off an appearance in the league's Fall Stars Game. The right-hander started three of his four innings with strikeouts and fanned the second batters of the third and fourth. When the Scorpions put the ball in play, Pearson distributed outs defensively with two on the ground and five in the air. Baseball's No. 90 overall prospect threw 32 pitches for strikes and dropped his ERA to 8.22. 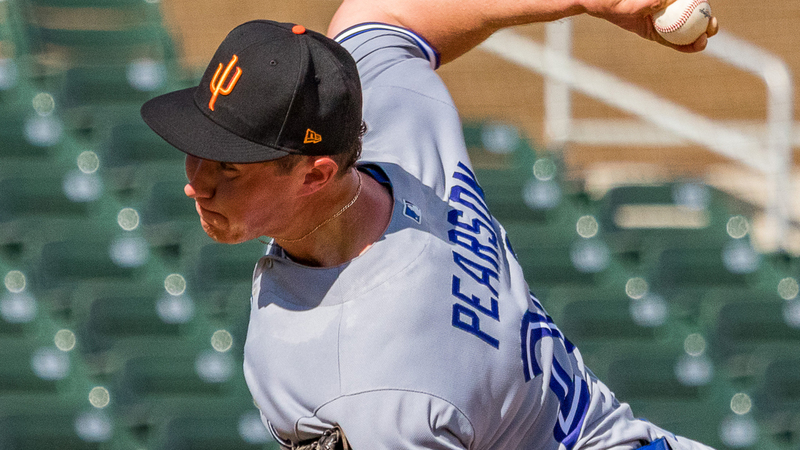 Pearson had been tagged for at least three runs in three previous outings for the Saguaros, including four on seven hits over four innings on Oct. 29, his final start before the Fall Stars Game. In Saturday's showcase, the 22-year-old yielded just one run on one hit while whiffing a pair for the West. San Francisco's No. 28 prospect C.J. Hinojosa broke a 1-1 tie with a three-run homer to left field in the seventh for Scottsdale. But Andy Young (Cardinals) and Pittsburgh's No. 16 prospect Will Craig belted back-to-back homers to center and left-center respectively -- Young's a two-run shot -- to draw Surprise even in the ninth. After Nick Heath (Royals) tripled to right with two outs, top Astros prospect Kyle Tucker walked it off with a single to right. Cincinnati's No. 8 prospect Shed Long was involved in a scary moment in the sixth when he dove for a line drive hit by top Toronto prospect Vladimir Guerrero Jr. The smash, clocked at 110-mph exit velocity, appeared to hit Long in the forearm and caromed to shortstop Andres Gimenez -- the Mets' top prospect -- who relayed it to first for the out. Long stayed down momentarily before exiting the game under his own power.